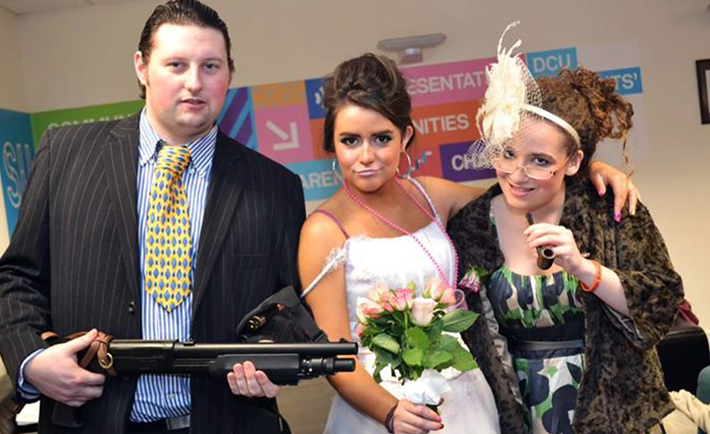 DCU’s Welfare Officer has defended the recent mock wedding which was overshadowed with controversy following a fake stag party where naked strippers performed in NUI Maynooth’s college bar. The mock wedding, which was a joint venture by both DCU and Maynooth’s Students’ Unions, raised over €8,000 for CARI, Smiles for Shauna and HeadstARTS. It was described by Lorna Finnegan as DCU’s “most successful” charity event this year. In a statement to The College View, Finnegan said: “It is extremely unfortunate that these events [in Maynooth] are overshadowing what we can only describe as our most successful RAG event in recent years. “We have received nothing but positive feedback from students since the event. The students bought into the theme positively throughout the week”. Maynooth SU President, Ben Finnegan said the fake stag party was “totally unacceptable”. He also clarified that although the mock wedding in conjunction with DCU SU was an official event, the fake stag party held at the college bar was unofficial and denies the strippers were paid using SU funding. A number of female strippers performed at the event and allegedly stripped completely naked. It is understood that the performers were arranged by outside students and not by any member of the SU.